Holly Newman is a graduate of Vanderbilt University, Nashville, TN, with a BS in Nursing. She is an RN and an IBCLC (International Board Certified Lactation Consultant). She directed the Lodi, California office of the BEST (Breastfeeding, Education, Support and Training) program, and has been a certified La Leche League leader for 17 years. She was Breastfeeding Coordinator for the WIC program in Amador/Calaveras County for 5 years. 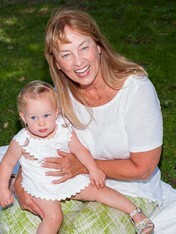 Holly began Lodi Lactation as an in-home private practice lactation service in 2008. In March 2017 she passed her re-certification by exam as an IBCLC. Holly is the mother of five grown children who were all breastfed, and ten grandchildren, including a set of twins, also all breastfed. She has been married for 47 years to Steve Newman. Holly brings many years of experience as well as a supportive and compassionate attitude to the practice of lactation. Helping you to achieve your own breastfeeding goals is her mission. Holly with Edie, one of the twins.